The MultiDark database provides results from cosmological simulations performed within the MultiDark project. This database can be queried by entering SQL statements directly into the Query Form. The access to that form and thus access to the public & private databases is password protected - if you haven't done so, please register first via the Registration Form. More information on the simulations, the database, its design and the possibilities to access the data are described in the Documentation, where we also provide a demo video for getting started. MultiDark has moved to CosmoSim! 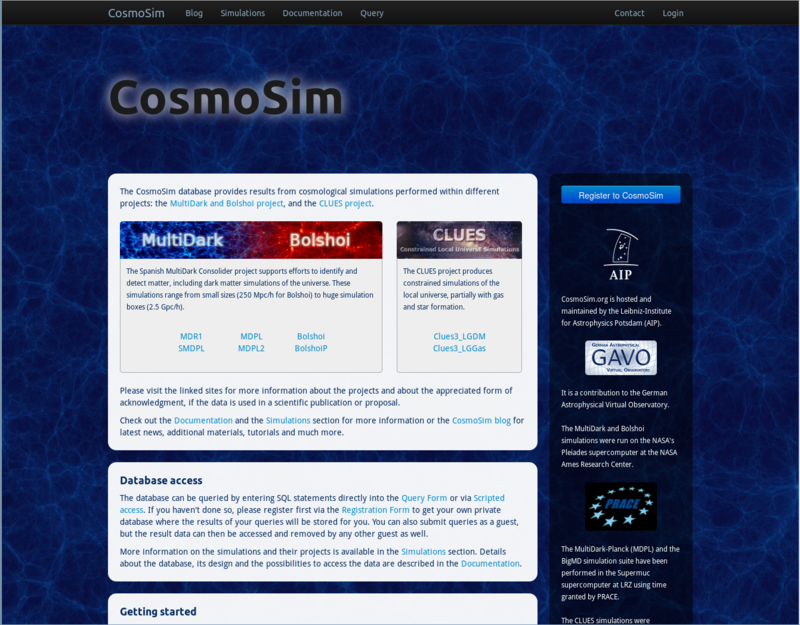 This MultiDark application is now integrated into CosmoSim, all data and much more is available there. The old MultiDark server is no longer available. Look at our What's different page to get a quick intro on what you should pay attention to when switching from the old MultiDark server (MS-SQL server) to the new setup at CosmoSim. If you have any troubles, please Contact us!